Kony is the leading low code platform for developing applications that enable digital transformation. With the Kony platform, you can build apps that span all the digital experience channels from responsive web (across a range of phone, tablet, and desktop dimensions), native mobile (including smart phones and tablets), wearables, and emerging digital channels, including voice and chatbots. Join us for a behind the scenes look at the making of our super cool Quantum Quest mobile app. 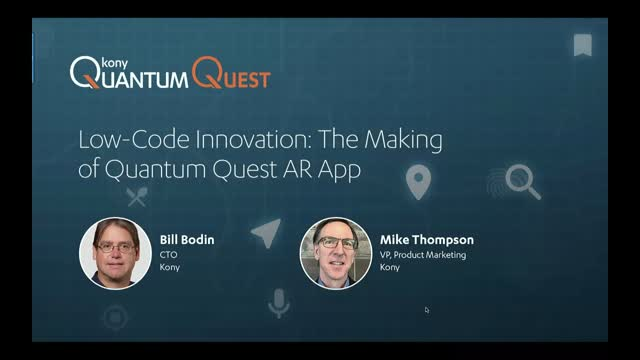 See first-hand how our team leveraged Augmented Reality (AR) technology and Kony Quantum to simplify the delivery of a complex application. Come listen to our CTO and his team as they show off the power of Kony Quantum and prove our claim – Low-Code Without Limits. Trends to transformation; get insights from the most anticipated and influential reports in the banking industry, the 2019 Retail Banking Trends and Predictions, published by Jim Marous, owner and publisher of the Digital Banking Report. In this :30 minute webinar with Jim Marous and Jeffery Kendall, senior vice president and general manager, Kony DBX, you will walk away with 5 smart strategies for digital transformation in 2019 and an exclusive discount code for your copy of the 2019 Retail Banking Trends and Predictions Report. A lack of development resources and increasing business demands are driving the need for low-code application development platforms. This webinar provides insight into low-code solutions that can flex and scale to meet mission-critical needs -- for employee, partner, and consumer applications. Come hear the Kony team discuss key architecture considerations that your low-code solution should support. Source: Application Architecture Summit: Integration Developer News. Corporate development teams are adding low-code platforms to their arsenals to speed application development. Why? Speed of delivery is crucial to business success, particularly for digital transformation initiatives. Come to this webinar to learn the reality of the low-code trend. Our guest speaker, John Rymer, from Forrester will bust the most common myths associated with low-code development platforms and look ahead to the new uses and unfolding strategic value that low-code brings to enterprises. The rise of progressive web apps is causing an additional step in your mobile decision process. Should you go Native or should you build your next progressive web app? From our own experience we have learned that there is no one size fits all. In this webinar, we will provide guidance to make sure you have everything you need to make the right choice. Join us on February 19 at 8:00 am CST in a webinar featuring Alex Cobb, Founder and CTO of VESTIS and Faizan Khalidi, Sr. Director of Product Management at Kony, as they discuss Progressive Web Apps (PWAs) and Alex’s real world experience using PWAs to develop rich-media desktop, tablet, and mobile apps that showcase high-end real estate in the VESTIS Collection. PWAs are an emerging technology that use the open standards of the web offered by modern browsers to provide benefits of a rich mobile experience. PWAs are web applications that load like regular web pages or websites but with extended features such as working offline, push notifications, and device hardware access traditionally available only to native mobile applications. Can’t make the live webinar? Register now and you’ll receive a link to the recording that you can play back at a time convenient for you. As markets are shifting at an increasingly rapid pace, digital banks and their underlying software architectures need to respond by adapting faster than ever before. As no single vendor can provide market leading components for every part of a digital bank, the successful digital bank's architecture is designed in a composable way, bringing together API-driven systems to support the business. Apart from flexibility the composable architecture allows the digital bank to be future-resilient, as it makes it possible with quick alignment of products and services to capitalise on newly identified market opportunities as well as to stay relevant with any shifts in the market. To keep up with the pace of digital innovation, enterprises demand ever more from their low-code platform. Yesterday’s advanced features are today’s minimum requirements. What low-code capabilities will you need to succeed in 2019? Web Apps vs Native Apps - Will Progressive Web Apps Dominate in 2019? Don’t miss this webinar with guest speakers Michael Facemire, VP, and Principal Analyst from Forrester and Alex Cobb, CTO from Vestis, as they join the Kony team to discuss a hotly debated topic in the industry - Web Apps vs Native Apps. Up until recently, the pros and cons behind building native mobile apps versus mobile web apps were well understood. But the rapid evolution and adoption of Progressive Web Apps (PWAs) is leading many to believe the need for building native mobile apps is diminishing. The state of digital technology is at an inflection point, with wide implications for the future of your next app development project. •Is the debate around mobile still mobile web app vs. native app, or are there new options that change this dynamic? •If you already have a native mobile app, should you get rid of it to build something new? •What is a Progressive Web App, what makes it different than existing web assets, and different than the apps we’ve currently built, and what tools do we need to build them? •How do hybrid app technologies like Cordova / PhoneGap fit in the picture in the future?